Make guests feel at ease with a bottle coaster that looks stunning on countertops or outdoor tables. 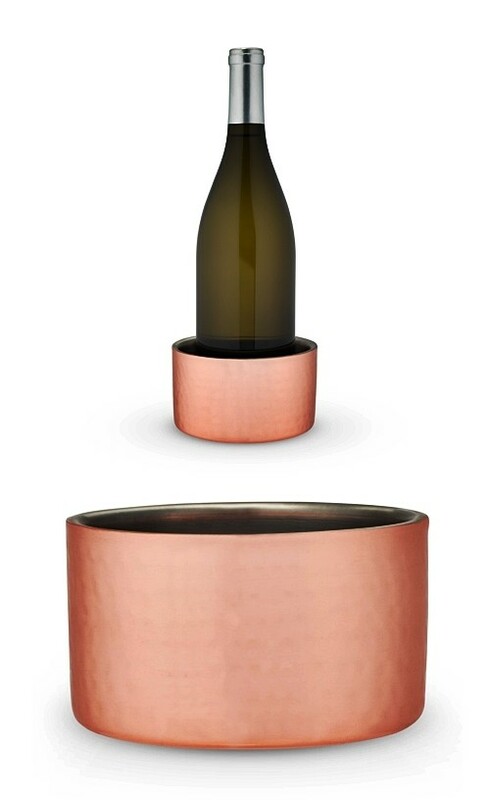 Crafter from copper-plated stainless-steel, this handsome, hammered-finish vessel holds standard wine and champagne bottles. Double-walled construction keeps bottles cool and tabletops dry. PLEASE NOTE: Pictured wine bottle is not included. "Our inexpensive wedding favors arrived earlier today. I am so happy that I found your website, and very pleased with my bridal accessories. Thanks again for the wonderful job you did on personalizing these. I will be back to your website as a repeat customer for sure." Lisa F.